A construction worker was trapped waist-deep in mud for four hours at a Second Avenue subway construction site 75 feet below ground Tuesday, and FDNY officials said the rescue was among the most difficult in recent memory. The worker became stuck after his foot got caught in some equipment at about 8:30 p.m. Tuesday, and more than 150 firefighters, along with responders from the NYPD and Office of Emergency Management, rushed to the site at 95th Street and Second Avenue. An FDNY battalion chief tells NBC 4 New York that the mud was like quicksand. 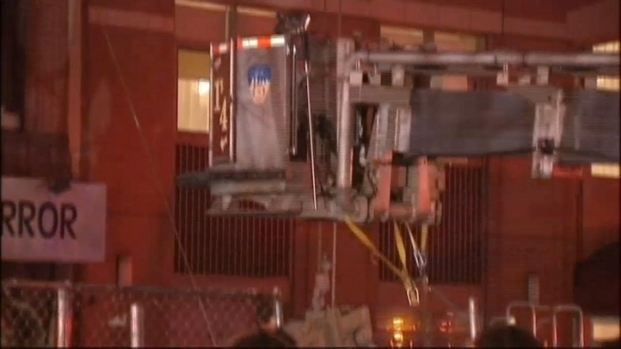 Rescuers used a Con Edison industrial vacuum, pulleys and plywood to get him out. An FDNY chaplain was also on hand to pray with the man. "In my 36 years of the Fire Department, this was the most difficult, technical rescue operation I've ever been involved in," said FDNY Battalion Chief Donald Hayde. Firefighters are working to free a construction worker from mud at the site of the Second Avenue subway construction project on the Upper East Side, authorities said. This is raw video from the scene. FDNY Commissioner Salvatore Cassano said "it took some of our top people in our special operations command with vast amount of knowledge and technical rescue to put all those skills into play." "It it wasn't for them," he added, "that worker would have surely perished." FDNY Lt. Rafael Goyenechea, who spent time with the trapped worker, said: "His spirits remained very well, he talked about sports, his family, everything. I kept holding onto his hand when I could, covering him with blankets when possible to cheer him up." After more than half a century, the drills are still at work along Second Avenue. News 4's Katy Tur takes an in-depth look at the construction project. Three firefighters suffered injuries that were not life-threatening during the complicated rescue operation. Cassano said the injuries were broken bones and hypothermia. Hypothermia was also a concern for the worker as rescuers toiled for four hours to free him. He was carried out on a stretcher at around 12:30 a.m. Wednesday. Authorities say he is awake and conscious and is being evaluated at a local hospital. MTA spokesman Kevin Ortiz said work has been suspended in the area near the accident scene until further notice. He said it would not slow down the overall progress of the construction. In August, a controlled blast at the Second Avenue construction site sent rocks flying into the streets when steel plates covering the blast failed.